When is the last time you treated yourself to a long, luxurious and soothing bath? I have recently had the wonderfully, relaxing pleasure of exploring Dr. Teal's Foaming Bath and I'm pleased to not only introduce but recommend this line to you! Dr. Teal's offers a full range of soothing bath products specially designed to calm your body and relax your mind, utilizing the tranquilizing strength of epsom salt and infused with aromatherapy science. The latest offering from Dr. Teal's is their collection of foaming bath products. Available in four specialized formulas, you can select the perfect product to soak away the stresses and aches of your day. Dr. Teal’s Foaming Bath will melt away sore, uncomfortable muscles and provide a soothing oasis for you to rest, allowing you to replenish your body and stay on track to reach your fitness goals. Dr. Teal’s Foaming Bath transforms an ordinary bath into a relaxing spa experience by combining the unique, therapeutic benefits of Epsom Salt with luxurious essential oils to relax achy muscles, soothe the senses and provide relief from stress. 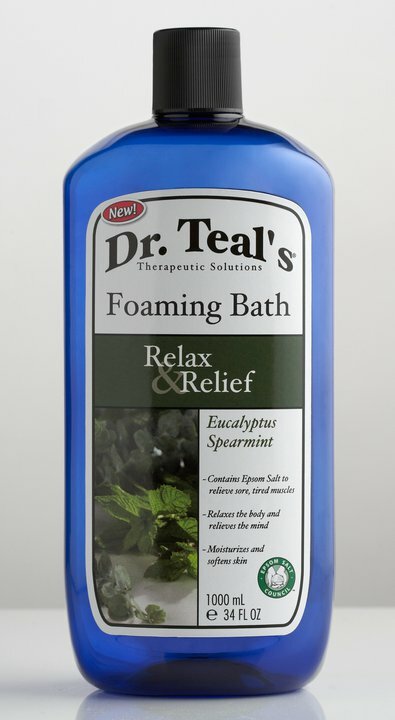 Soaking in Dr. Teal’s Foaming Bath will help to naturally increases the body’s magnesium levels and reduce swelling because of its ability to draw out fluids. I was given an opportunity to test the Relax & Relief formula and both my teen diva and I are hooked! With all of my daughter's sports training, she is often strained and sore. Her feedback: It actually worked! My muscles aren't aching and I feel so relaxed! I've tried the Dr. Teal's Foaming Bath after a hard work day and found the experience so relaxing, but it was hard to say, since I don't treat myself to an after work soak as often as I should, how much benefit was attributable to Dr. Teal's. Fortunately, a perfect opportunity presented itself today. I fell asleep in our family room, snuggling with my furry son on the couch, while watching a movie. Of course, the furry one is a couch hog and I woke up, half -on/half-off the couch, with an aching back. Not just a mild ache, but the kind that puts you out of commission, doing the grandma shuffle. After trying ice, heat, Aleve and husband massage with no relief, I shuffled up to the bath to give Dr. Teal's Foaming Bath a try. Twenty minutes later, I feel fantastic! Not even a residual ache! 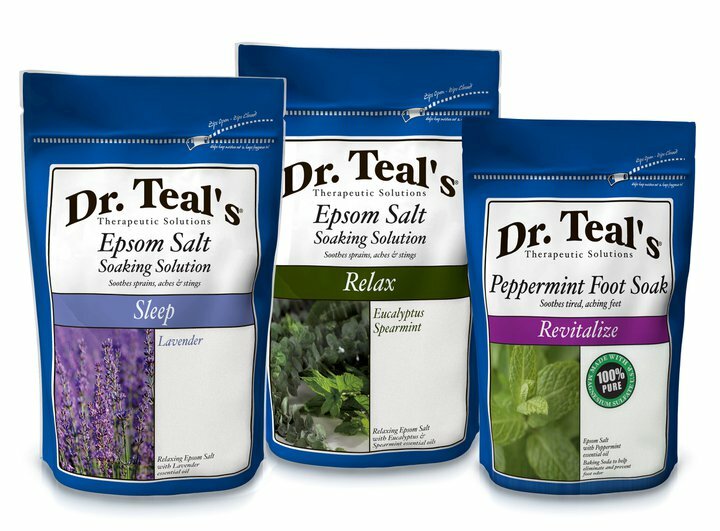 I'm confident that the epsom salt in Dr. Teal's is to credit, with the eucalyptus and spearmint leaving my skin soft and my mood refreshed. 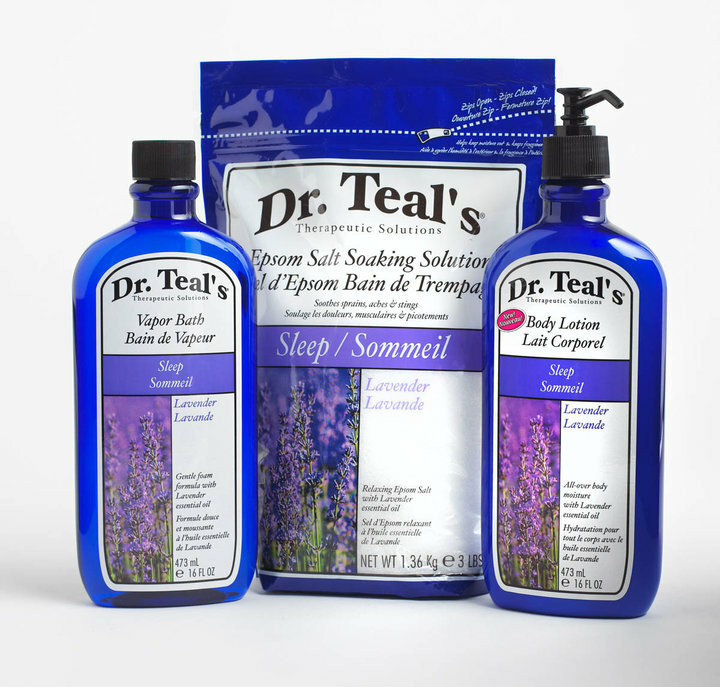 Dr. Teal's offers a full line of pampering products to soothe and relief what is ailing you! Best of all, these wonderfully scentful items are budget-friendly and widely available. 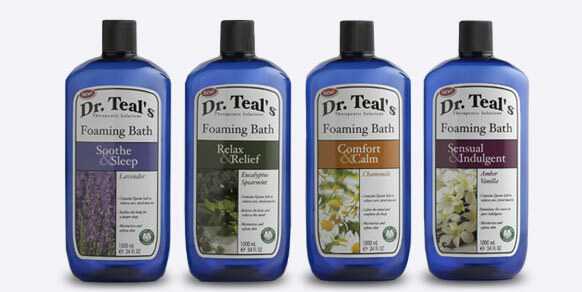 The generous 34oz bottles of Dr. Teal's Foaming Bath retail for only $5.99! Every woman can squeeze this pampering treatment into her budget! 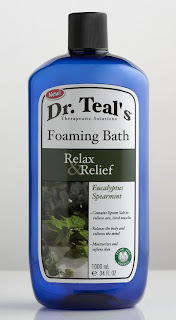 Dr. Teal's is generously offering my readers a chance to win a 34oz bottle of Dr. Teal's Foaming Bath! Three readers will win! You must follow That's What She Said via Google Friend Connect, left sidebar, to be eligible to enter this giveaway. This giveaway is open to residents of the US, 18+ and will end on Saturday, August 20, at midnight, EST. The winners will be randomly selected from all eligible entries and notified by email. Winners will have 72 hours to respond before I must move on to runner ups. Please leave your email address, in anti spam format, in your first entry comment, so I may contact you if you are the winner. If you email address is available via your comment name, this is not necessary. To be eligible to enter this giveaway, you must follow That's What She Said via Google Friend Connect, left sidebar. explore the information on the Dr. Teal's aromatherapy page and tell me which formula/scent is most appealing to you and why. * Like Dr. Teal's &/or That's What She Said on Facebook, leave comment here with your Facebook name, 1 entry for each. * Follow Dr. Teal's &/or That's What She Said (tsue1136) on Twitter, leave comment here with your Twitter name, 1 entry for each. * Tweet about this giveaway. Leave comment here with a link to your tweet. Limit of 3 tweets per day. * Share this giveaway in some other fashion! Anything goes - Alexa, Stumble, Digg, Blog it, Giveaway linky. Just be sure to include a direct link here in your sharing. 5 entries for each sharing method. Leave a comment here with a link to your sharing so I can find it. * Enter any of my other active giveaways and leave a comment letting me know which. 2 entries for each additional giveaway. * Subscribe to That's What She Said via email or RSS feed, left sidebar or follow me on Stumble! Leave applicable name in your comment. 1 entry for each. * Put my button on your blog (left sidebar) and leave a link in your comment so I can find it. 2 entries. THIS GIVEAWAY IS CLOSED. THE WINNER HAS BEEN EMAILED AND WILL BE ANNOUNCED SOON. On behalf of Dr. Teal's and That's What She Said, thank you to all entrants for following and participating! I was provided with Dr. Teal's Foaming Bath to explore for the purposes of creating this feature. The opinions above are both honest and my own. Images and information taken from various Dr. Teal's sites. Bath Image. Facebook is not responsible for nor involved in this giveaway in any fashion. I would love to try their relax product. I need more relaxing in my life! I'd like to try the Relax Epsom Salt Soaking Solution. I often have stressful days and need a good relaxing bath when I get home at night! I would love to try their epsom salt foot soak! 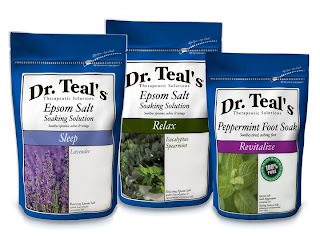 I would love to try Dr. Teal’s® Therapeutic Relief Soaking Solution to help relieve a lot of my pain. The one that appeals to me most is Lavender Soothe & Sleep because I have severe insomnia! I would like the Dr. Teal’s® Oatmeal Bath Soaking Solution. I want to try the Relax and Relief foaming bath to help with my chronic pain. Soothing Mint & Rosemary -Therapeutic Relief is the one that intrigues me most. I love to relax in a nice hot bath.